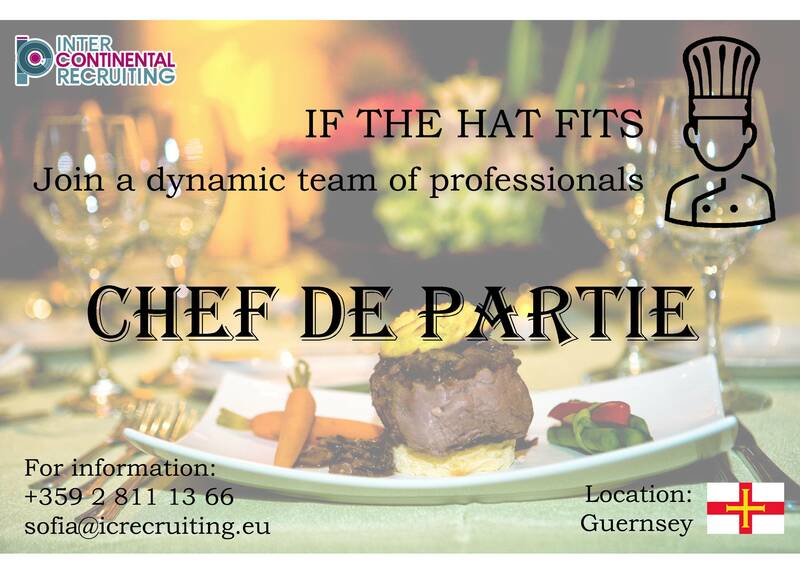 Our Client, a premium chain of restaurants in the Channel Islands, is currently seeking 3 Chef De Partie to join the restaurant's team in Guernsey. The second largest of the Channel Islands, Guernsey has mild winters and warm sunny summers. The charming Saint Peter Port offers a variety of high-end restaurants, exquisite seafood cuisine and picturesque promenades. The restaurant you would be working in, is among the top on the island, offering a variety of dishes in a pleasant environment. Applicants arrange their travel to Guernsey and pay the travel cost. If you are interested to apply, please send your CV in English to n.trajkovska@icrecruiting.eu or call +359 2 811 1366 from 10 a.m. till 7 p.m.
All applications will be treated in strict confidentiality. Only short-listed candidates will be contacted for an interview. IC Recruiting Ltd. Recruitment license from National Agency of Employment No 2088 / 22.07.2016.